Chameleon is a shared code library for Minecraft 1.8 and later. Although it does not currently provide rendering hooks to restore the 1.7 render pipeline, it does provide a more comprehensive RenderBlocks replacement that is also suited for TESR rendering. 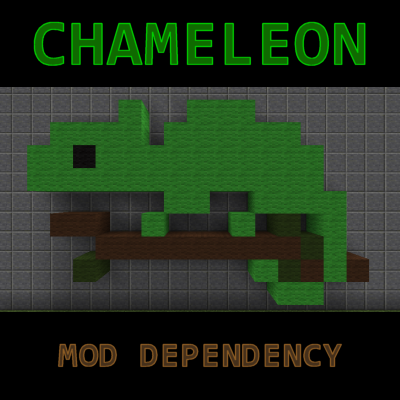 Chameleon is required for jaquadro's mods in Minecraft 1.8 and later. It will say in the lower corner of the main menu. I've been reading the comments allot and yeah i've tried some of the things the comments say, but with no results. I also updated to the latest forge which is the 2707 and redownloaded the chameleon mod's newest version ( have the 4.1.3) can u please tell me if im missing something ? i went thru my 70+ mods 1 by 1 and im pretty sure the crash is caused by the chameleon mod. any advice ? I have downloaded the storage shelf/container mod. I am wondering, do I need this for it to work? I have downloaded the 1.12.2 version of the storage mod. I might not need the answer, but it will be nice to know beforehand. I have found out the answer to this by re-reading. I shall be on my way, thank you to whoever tried to help, though. If you try to start a mod without a dependency it will say that it misses it so you'll know. That goes for every mod. No. These are for the Java Edition only. Is this compatible with Servers (1.10.2) ??? StorageDrawers-1.10.2-3.7.10.jar,Chameleon-1.10.2-2.3.0.jar, Forge 1.10.2-12.18.3.2511 is giving me a client-side crash in Chameleon while tesselating the block model every time I try to look at a storage drawer placed in the world. (Specifically it's a 2x2 Acacia.) Actually placing the storage drawer unit does not seem to bother the server at all; only the client crashes. Let me know if you need the full crash log and I'll post a link. Using Storage Drawers 1.7.10, do I still use iChun or this? I don't know what iChun has to do with anything, but Storage Drawers for 1.7.10 has no dependencies. Chameleon is for 1.8+ only. You're loading MC 1.12 with a really old version of Forge. Update Forge and the crash should go away. EDIT: I downloaded the newest Forge Beta and newest Optifine, works like a charm with this and some other mods, sorry for taking your time. Keep up the good work! Instant crash if we place a storage drawer. Omg... that's strange. I thought I did but I'd copied it to the wrong MC folder. happens to the best of us, mate.